Often companies express their innovation effort (in general R&D) as a % of sales. 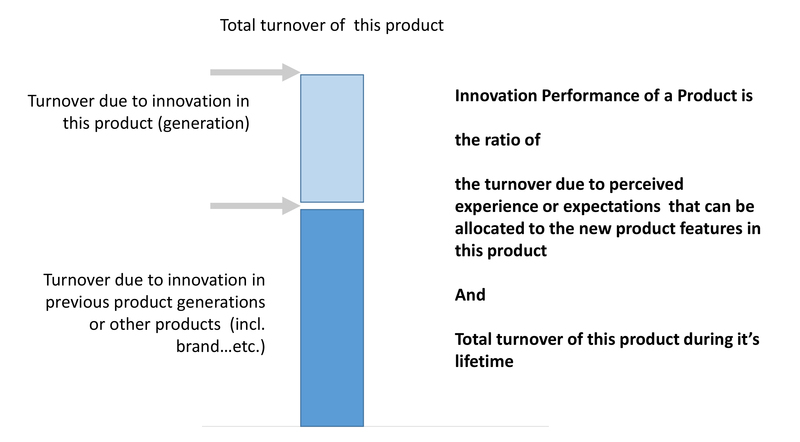 This is, as shown in this blog, a limited way of measuring innovation performance. In my courses and trainings I always use an alternative indicator for innovation performance by adding an historical perspective. I figured out this indicator over 15 years ago, when I came to the insight that, if in hindsight we can’t measure past innovation performance, how can we make any statements about future innovation performance, since these are only predictions based on extrapolations and deductions of the past? The blog starts with a simple definition of Innovation and then link innovation to added value. Then some issues with measuring new added value are discussed and alternatives are proposed. The word innovation comes from the root Latin word, “Innovare” and it means to renew, start again and initiate change . 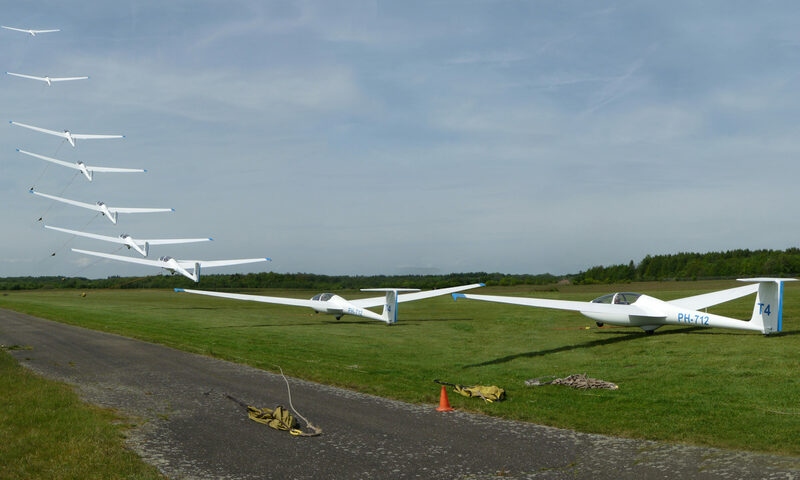 This is a very broad definition and in this blog we would like to be more focused and keep it simple by discussing an example of one organisation delivering a product to a customer. The approach is extendable to product categories, networks and to services. An important decision is the level of granularity that offers most valuable insights. Innovation is that part of the added value of a product sold to a customer that is new to him or her. Suppose we are a supplier, that offers a product. 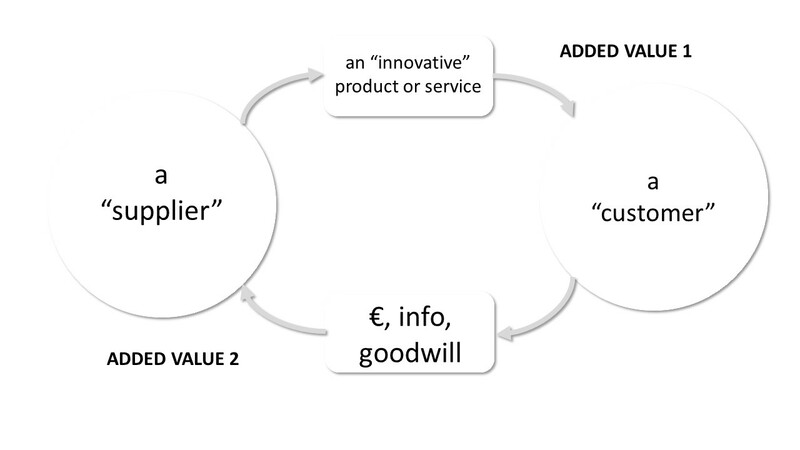 The customer buys and uses our product and this hopefully 🙂 adds value to to him or her (See fig 1. added value 1). This added value is an experience in the brain of the customer. Unfortunately, at this moment in time we do not have accurate means to measure the sensations in the brain of a customer associated with creating value. With current developments in brain research, this may change in the future. Still, if we can measure the sensations, there a second hurdle to take. Already in 1992, C. de Bont indicated that this experience of added value is also strongly depending on previous experiences and expectations of the customer. The sensations may not be caused by the product alone, they are always in an psychological and application context. Of course, since we are in business, we expect something back in return (added value 2). 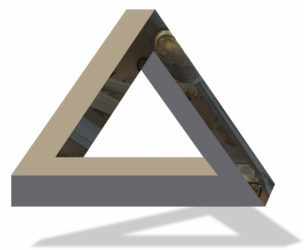 This can be money, information (information about use, preferences and behaviour of the customer) and goodwill (sharing positive experiences with others (measured for example by the Net Promotor Score ), positive attitude, loyalty to the product and making it easier for us to sell the product more and easier. Innovation in our definition is identified by that part in the added value (1) percieved by the customer, that is new to him or her. 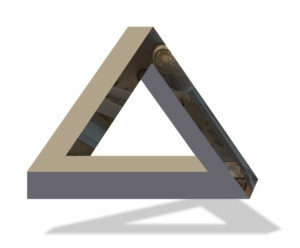 Due to the lack of observability, we can only guess what the true value of the ‘new’ part is for the customer. The most reliable feedback at this moment is added value (2), how much do we get back? This is also influenced by the difference in bargaining power bertween us and the customer and is part of the competitive context in which this transaction takes place. find the correlation with brand, product features or (delivery and communication)-process features that are new. To take this one step further, consider tracking whether customers are postively or negatively surprised by the product when using it. Because, this may lead to increased or decreased goodwill, impacting future sales. Let’s give a basic example to get the idea. because of product aspects that are new and for the first time introduced in this newest product generation. After asking enough customers to make your conclusions robust, you can make a chart that looks like figure 2. To take this one step further, consider tracking whether customers are postively or negatively surprised by the product when using it, since this may lead to increased or decreased goodwill, impacting future sales. 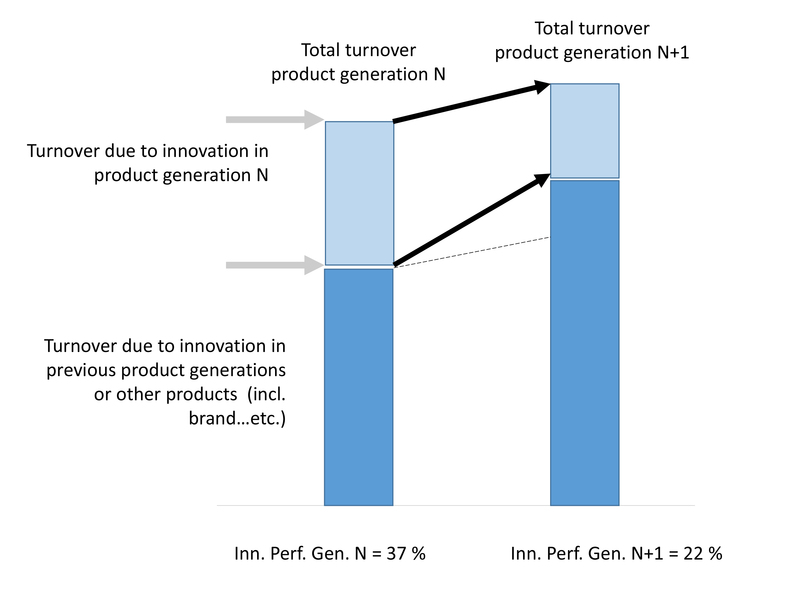 By tracking innovation performance for each product generation, interesting observations can be made. High Innovation Performance sounds good. However, the leverage of innovation in a previous product generation can be much higher and stretch over many future product generations, this however limits the current innovation performance. In figure 3, you see an example that innovation in past product generations via creating loyalty or increasing switching costs is still adding value (2) in the future generations to come. This is a highly appreciated situation, that implies a high innovation leverage and the creation of a sustainable advantage. If an innovative organisation is in this (comfortable) situation for a long time, the management must be aware that the innovation competence of an organization is less challenged and the innovation engine may become lazy and slow. On the other hand, low leverage of past innovative performance is also not without issues. Although low leverage of past innovation performance often leads to world-classes enabling(!) innovation competences, one has to keep throwing resources in the innovation engine, but the innovation leverage remains low. Moreover, goal-finding innovation capabilities do not develop, because the set of value drivers on which the customer assess your product are in most cases well-known. In extreme cases, every product generation is a new ball game. Many “mature” component companies are in this situation especially when competition is heavy and companies are played out against each other by their customers. So excellent innovation engine, but no profit. The Innovation Performance of the Product may give already quite some insight. However, it is rather internally focused and that is not very wise to do nowadays. 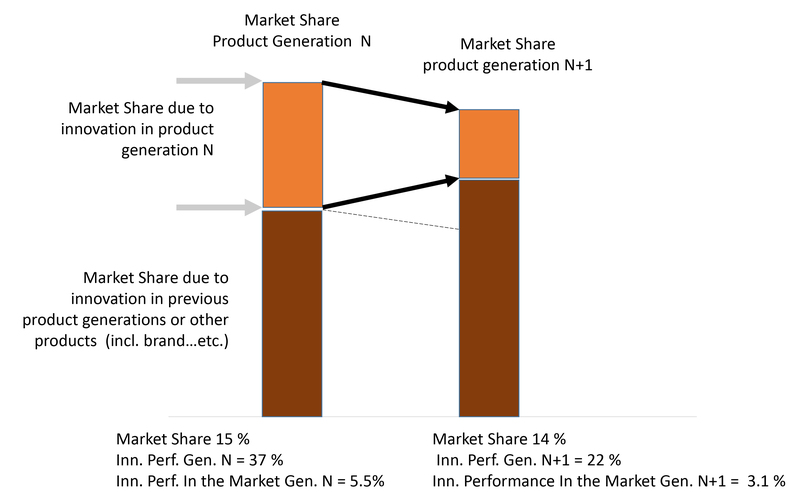 IPM in this example says that 5.5 % of the market bought your product because of the innovation in product generation N. Next generation that was reduced to 3.1 %. Message: You are in trouble in a fast growing market, your innovative sword has gone dull. Personally, I like short-cuts. I remember joining an innovation department and I wanted to get an idea of the Innovation Performance. I was asking the people, what was really new that had come out of the lab (for the last 2-3 product generations). I verified this with the commercial guys, get from them a best-guess what revenue we would have lost, if these new stuff would not have been there. And then it was easy to calculate a gutfeel innovation performance of the department. 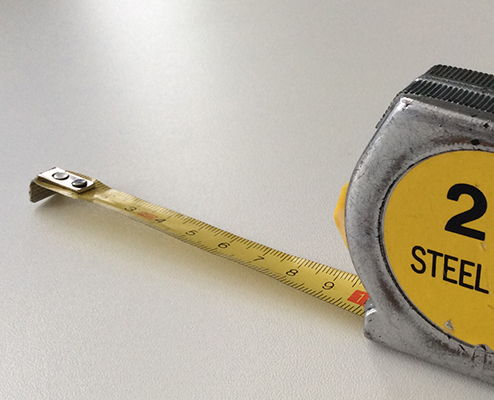 I must warn not to use this as an indicator to judge an innovation department. There are many other departments as well as higher management that influence innovation performance. Innovation Performance is measuring the output of the innovation process and it helps to look for bottlenecks in the innovation flow that limit the bang for the buck spend on innovation. Any questions or need for support to get an idea of the innovation performance of your company and define actions to improve innovative behavior of the organisation, do not hesitate to contact me.